【4 in 1 Aluminium APPLE WATCH STAND】 Works as an iWatch Stand, AirPods Stand, iPhone Holder and iPad 7.9, steadily holds your Apple Watch. 45° angel supports Nightstand Mode. Specially designed as an Airpods Accessories, avoids your Airpods missing. Vertical iPhone charging station allows viewing angle for facetime. ATTN: Apple Watch magnetic charging cable or iphone cable are NOT INCLUDED. 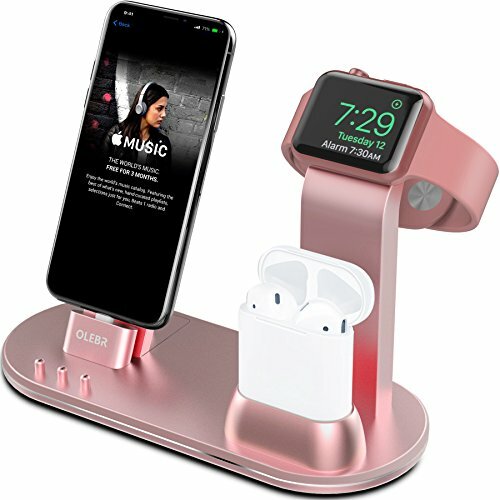 【DECENT DECORATION WITH SUBTLE ORGANIZATION】 Convenient to charge Apple watch,iPhone & Airpods at the same time in one place (Need to install your original apple cable and charger)- sturdy, neatly and orginazed. Looks good and elegant, perfectly decorates your bedroom, study, hall, office desk.